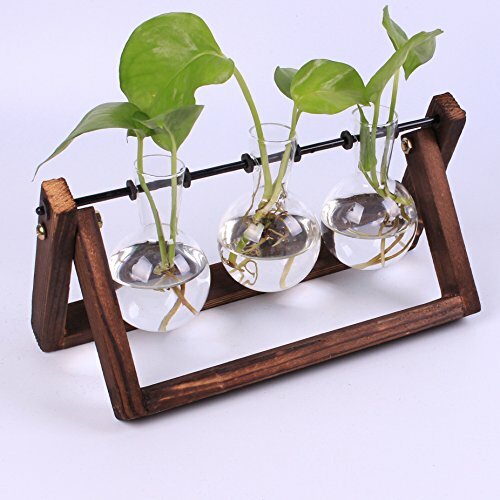 Siyaglass Glass Planter Bulb Vase with archaistic Wooden Stand and Metal Swivel Holder for Hydroponics Plants Home Garden Wedding Decor (3 bulb vase) by Siyaglass at Tulips Orchids. Hurry! Limited time offer. Offer valid only while supplies last. Made of nature wood,archaistic design treatment; bulb is made of borosilicate glass. If you have any questions about this product by Siyaglass, contact us by completing and submitting the form below. If you are looking for a specif part number, please include it with your message.